Climbing to the top of the Snowdon has been an adventure on my UK bucket list for a while before I finally climbed it. I tagged along with some friends initially but dragged more of my own friends in the name of charity, and we managed to raise quite a fair bit of money for the children of Palestine. Albeit a gruelling, exhausting and punishing experience and one of the physically AND mentally hardest thing I’ve ever done, the top was just as expected. If you spend enough time comparing hotels, flights, and tours, you’ll eventually realise that many words have very little meaning in the travel industry. You might think that there would be some sort of common agreement on travel terms across hotels that would define what makes a suite a suite or a deluxe room better than a standard room, but no such agreements exist. I’m often surprised to find that what I booked is not quite what I expected. Here are some travel hype words you should take lightly, and that might even signal you should do a little more research. Whether you travel once a year or year-round, you’ve probably run into this word over and over again comparing hotels. But do you know what it really means? Across hotel websites, “deluxe” is a travel term usually used to up-sell a room that is the same size as a standard room and looks like a standard room, but usually only has one feature that makes it any better. According to Merriam-Webster, the official definition of “deluxe” is “notably luxurious, elegant, or expensive.” When it comes to travel, though, it could mean anything from bed sheets with a higher thread count to the addition of a coffeemaker. So when it comes to selecting a “deluxe” room, the only part of that definition you can really count on is that it’ll be slightly more expensive. Before deciding to upgrade to anything deluxe, make sure you understand exactly how much more you’re paying for. Otherwise, you might find yourself paying a hefty margin for a fancy word. While it’s not as vague and thrown-around as often as “deluxe” is, “suite” is another word that doesn’t seem to have a concrete meaning. For some, a suite might mean multiple bedrooms, or at least a separate living room and kitchen area. However, when you’re comparing different hotel suite options, they can range in size and layout dramatically. Even hotels that market themselves with the word itself in their names, such as Candlewood Suites or Comfort Suites, often have vastly differing opinions on what the word means. At Candlewood Suites, accommodations can be a bit basic, but there are multiple rooms and a full kitchen. Suites at Comfort Suites don’t necessarily have multiple rooms and extra amenities, but may be a little bit bigger than your standard hotel room with a few “deluxe” touches thrown in. Let me start by saying that I adore boutique hotels. I love their small-scale attention to detail and that each one has a distinct look and design. That being said, “boutique” is a relatively new and trendy word that gets thrown around far too often, and few people know its true definition. Some people say that a boutique hotel can only be considered such if it has fewer than 100 rooms—but if that were the case every truck-stop motel across the country could slap the word “boutique” above the vacancy sign. If you really want to experience a boutique hotel, look for something petite and artsy. A boutique hotel should feel like an independent hotel with its own distinct, locally focused style—even if it’s owned by a bigger hotel conglomerate. For example, MGallery is a boutique hotel brand owned by Accor Hotels. In Melbourne, Hotel Lindrum pays tribute to the building’s history as a pool hall. In Prague, the Century Old Town Hotel is an homage to Franz Kafka, the city’s most famous author. True boutique hotels use design to evoke a historical connection to their location. What’s the difference between a five-star hotel and a four-star hotel? It depends who you ask. When you’re looking for hotels across booking sites like Expedia or Travelocity, it’s not uncommon to see different “star” ratings on the same hotel. Depending on the source, hotel star ratings are based different things: Expedia, for example, takes into account “hotel amenities, media reviews, customer experience, and professional benchmarks” to come up with a rating. Meanwhile TripAdvisor simply displays an average of customer reviews. You could spend hours trying to compare all the different ratings of one hotel to decide how good it is, but should you? Probably not. Ratings are arbitrary and the rules are constantly changing, so it’s better to do your own assessment of what you need in a hotel, and how well it will suit your needs. Having typed in many hotel Wi-Fi passwords for access to lagging Internet, I feel comfortable saying that the phrase “high-speed internet” is one common travel term that doesn’t mean anything. With fluctuating numbers of guests, hotel internet is notoriously finicky and vastly unreliable—especially when travelling abroad or to rural areas. If you need a fast connection on your trip, don’t ask the hotel about its Internet speed. Instead, check out Hotelwifitest.com which collects Internet speeds of hotels across the globe. Do a quick search before you book if you’ll need fast Internet, and if you’re unfamiliar with internet speed measurements, run a quick test from your home connection for comparison. This will give you a good idea if the hotel’s Internet will be better or worse than what you’re used to. Nobody really expects a whole lot from the hotel fitness centre, do they? Personally, if there’s a treadmill, some weights, and a yoga mat—I’m happy. While it’s not uncommon for fitness rooms to be on the small side, some are seriously claustrophobic excuses for a “fitness centre,” and the equipment can be pretty basic. Also, keep an eye out for fitness rooms that aren’t necessarily located in the hotel: Many hotels, especially in large cities, have a deal with nearby full-service gyms that allow hotel guests to use their facilities. While it’s nice to be able to use a real gym, you might not be as motivated to work out if it’s located a block or more away from where you’re staying. For those who hike the Appalachian Trail, “walking distance” means from Georgia to Maine. For those of us who are running late to dinner downtown, however, walking distance better mean under 15 minutes. Probably one of the most subjective travel terms in the industry, never take “walking distance” at face value, and always consult Google Maps. Like walking distance, “access to public transportation” can mean just about anything. If you’re relying on public transportation to get around, it’s more helpful if your hotel is located on a major stop than if you have to walk 20 minutes to get there. Similarly, this phrase could mean the hotel is near a bus line that will take you to another bus line that will finally connect you to the main subway, when you really only want to buy a pass for the subway. If deciphering bus schedules and managing transfer tickets isn’t your idea of a good time, make sure to map out the routes you’ll take before you make the booking. I’ve spurned too many sad displays of near-stale white bread to ever feel contented by the phrase “continental breakfast.” So what is a continental breakfast? The term has British origins, originally referring to the light breakfasts of mainland Europe, and Merriam-Webster officially defines continental breakfast as “a light breakfast (as of rolls or toast and coffee).” But when modern travellers, especially Americans, hungrily approach a hotel breakfast spread, we want options and, at the very least, a waffle maker. If access to a quick yet substantial breakfast is important to you, call ahead to see what the hotel really offers in their continental breakfast. If you don’t think that will be enough food for you, scout out some nearby cafes or brunch spots instead. While this may be a fine word for a historic bed and breakfast or inn, be wary of any hotel describing itself as “quaint.” It might just be old. If scratchy sheets, peeling paint, and musty smells aren’t your idea of “quaint,” you might want to shop around for a more modern hotel. Dreaming of a holiday but don’t want to wait until the summer, like me? No problem. 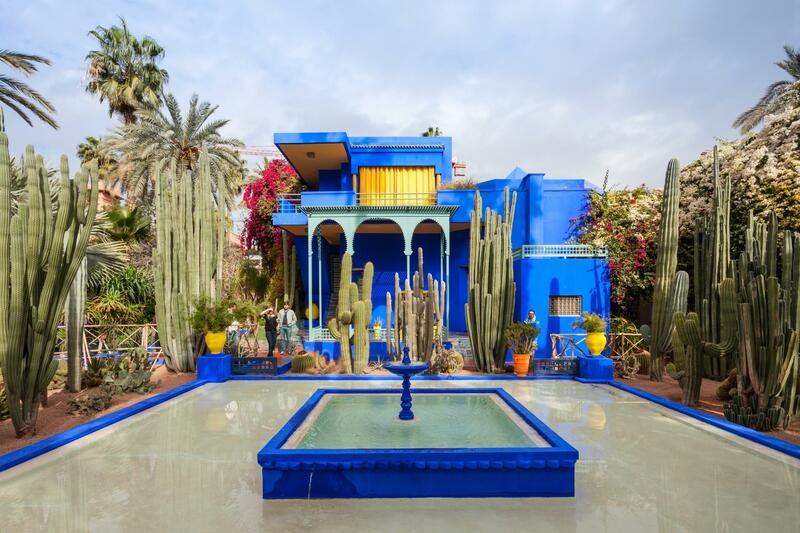 With cheap, direct flights from London and the promise of winter sun – Marrakesh in late February is a no brainer. 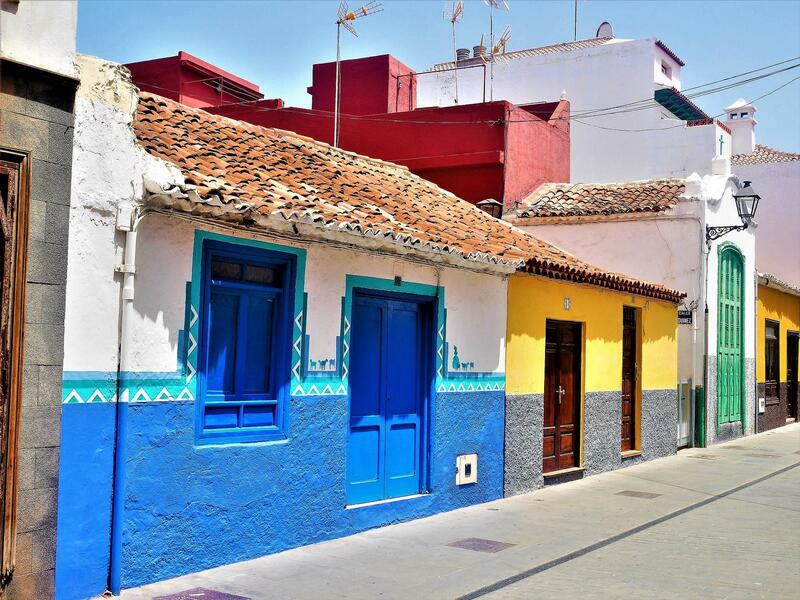 Temperature highs can reach 20 degrees and it’s one of the best times of the year to explore the Medina, the new Musee Yves Saint Laurent and practice your haggling skills at the souks without the stifling heat that comes in Spring. This year Carnival in Rio de Janeiro will take place between the 9th and 14th of February and there are few better reasons to make the trip to Brazil for. Famous throughout the world, Brazilian dancers with the most incredible costumes move throughout the city and tourists and locals alike bring in the early hours of the morning at street parties, known as blocos, and at costumed balls called bailes. 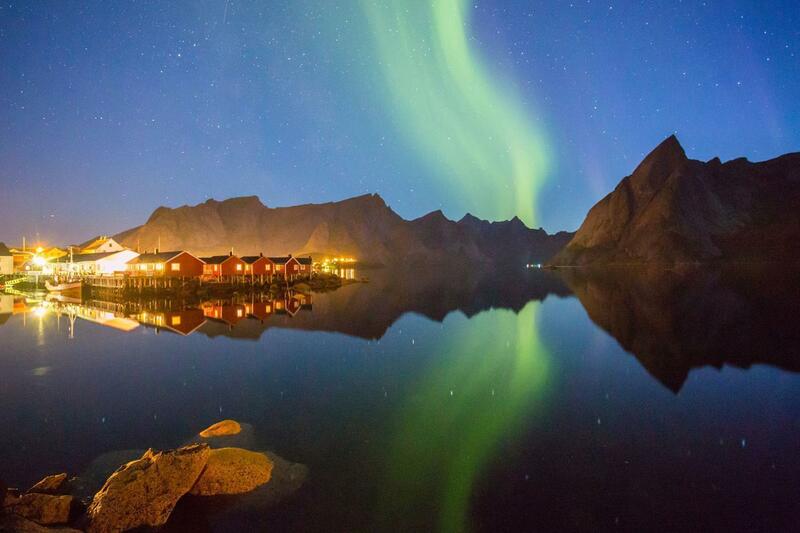 Who doesn’t have seeing the Northern Lights on their bucket list? This February head to the Arctic Circle – Svalbard in Norway to be specific- a gentle nod towards my all time favourite movie The Golden Compass. An archipelago situated between mainland Norway and the North Pole – you essentially can’t get more Northern than this. If you’re really, really lucky you may even see polar bears roaming around too. 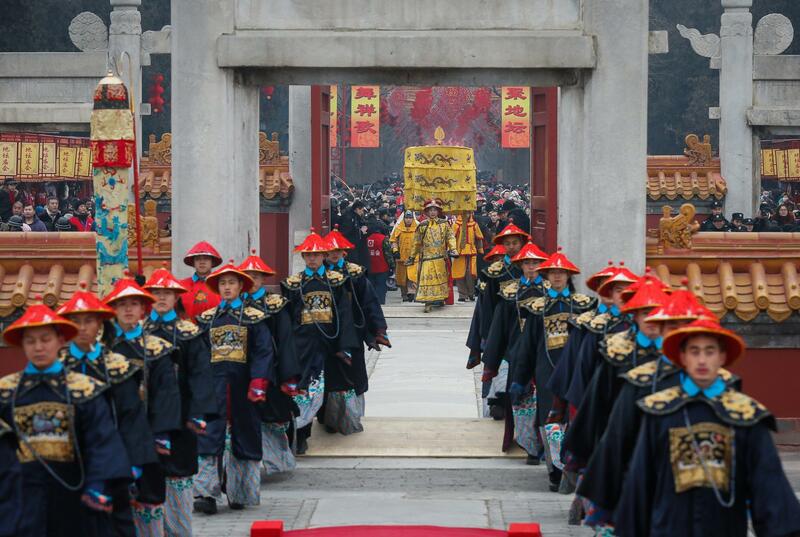 No one heads to Beijing in February for the weather but it is one of the best cities in the world to experience Chinese New Year. The biggest holiday of the year for the city, you’ll see temple dances, eat at banquets, watch million-pound firework displays and see the streets lit up with show-stopping light installations. Once the celebrations are over, you can explore the city, tick the Great Wall of China off your bucket list (it’s located just an hour and a half outside of the city) and if you have time, carry on your holiday in Shanghai – it’s only a two hour flight away. New Orleans Mardi Gras is hard to beat. 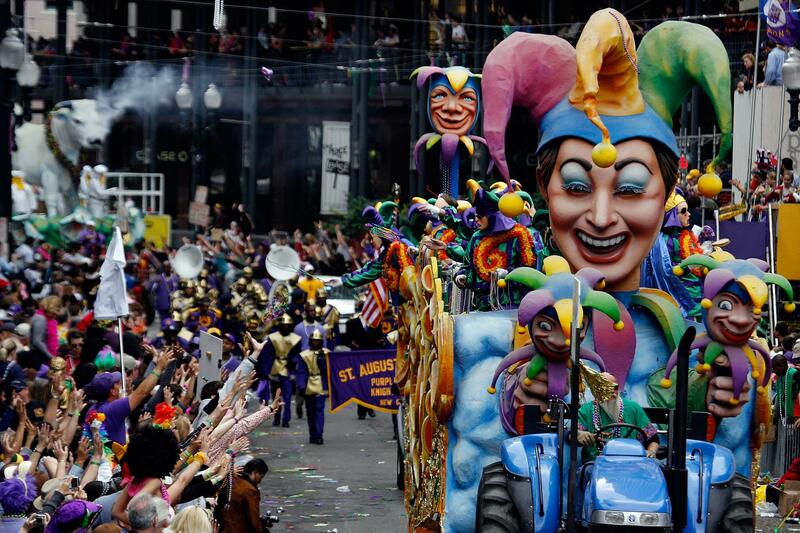 Taking place each year in February, the festival sees 1.2 million tourists descend on the French Quarter and surrounding streets ready to party, hard. Experience it for a few days and then get to know the rest of Louisiana’s largest city. With a history steeped in Voodoo, be sure to take a graveyard tour. Eat turtle soups during a traditional “Friday Lunch” at one of the century old restaurants, shop in the achingly trendy Magazine Street, listen to live jazz and don’t leave without spotting alligators in one of the swamps located on the outskirts. Tourists have long been flocking to Angkor Wat, Cambodia’s awe-inspiring temple and one of the wonders of the world. But its magnificent, unspoilt coastline has remained relatively untrodden compared to neighbours Thailand and Vietnam. With a number of new, luxury hotels including the The Six Senses resort on Krabey Island and Alila’s eco-resort on Koh Russey, it’s hard to think of a more idyllic place to get your vitamin D hit. 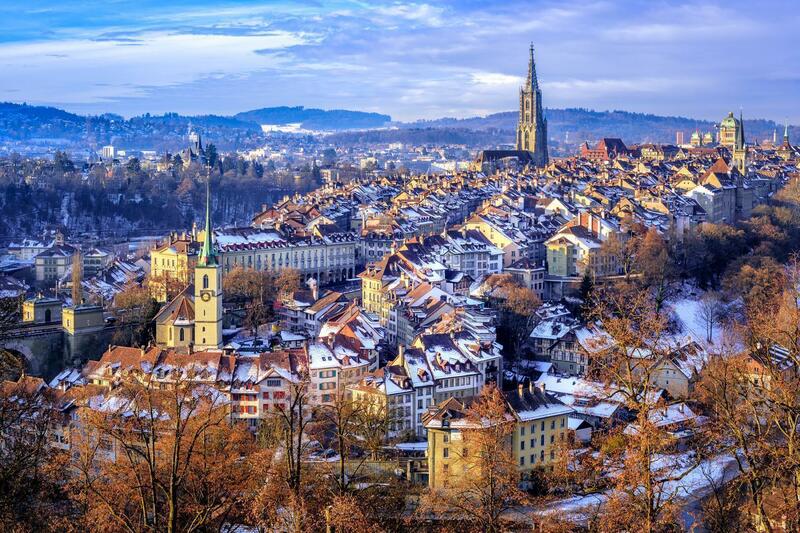 If you want to do European winter properly, you won’t get much more of a snowy paradise than Switzerland’s Bern. Not only was it voted the most Instagrammable winter city in the world (beating Aspen..) in 2017, the city’s whole old town is in fact a UNESCO World Heritage site. You can ski in the surrounding slopes, ice skate on The Schwarzsee mountain lake which completely freezes over and then come nightfall take refuge in a genuine igloo. Venice in February is cold but it rarely looks more beautiful under the dimly lit, silvery winter sun. 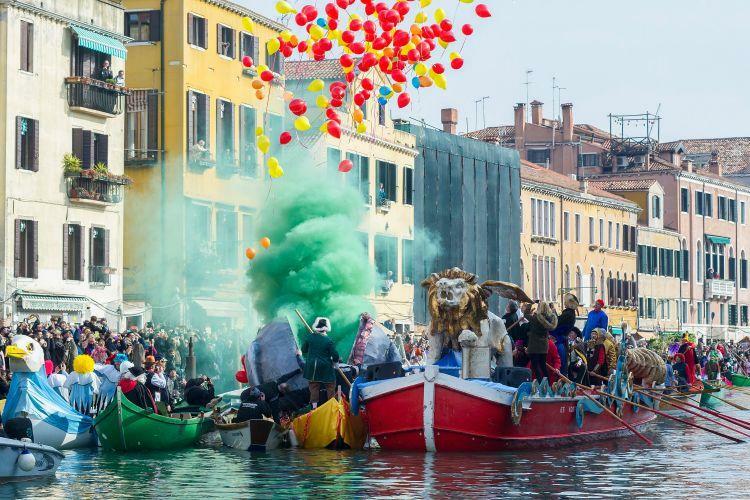 Aside from the obvious perks of less tourists and fewer gutter smells, a major pull for visiting in February is that this is when you can experience the unique Carnevale di Venezia. A traditional carnival that has been celebrated all over Italy for centuries, participants use it as an occasion to indulge before they undertake the Christian practice of Lent when people give something up for 40 days until Easter Sunday. 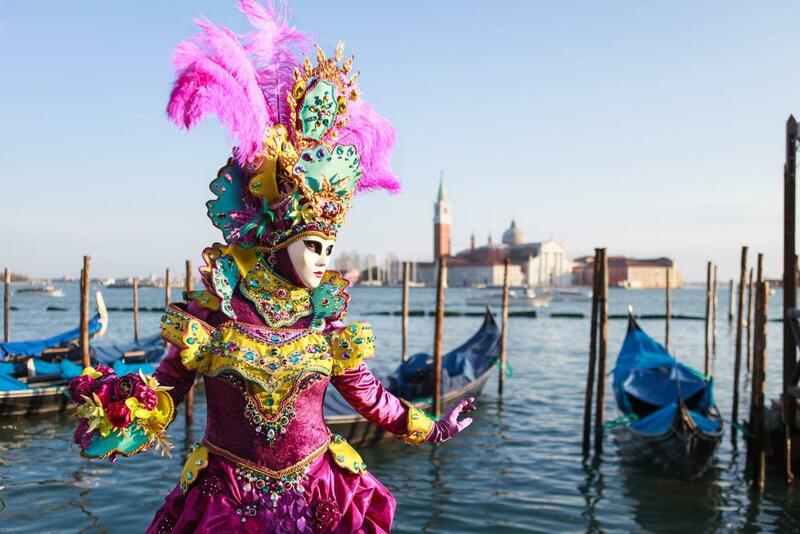 Each year entertainers bring alive the canals and alleyways through dance, costume and performance and if you’re into Venetian masks, this is the best time to see them in all their glory. If you’ve overlooked Canada in favour of America, you’re missing a trick. Canada’s landscape looks particularly beautiful during the winter and if you’re an adventurer February is when to go. 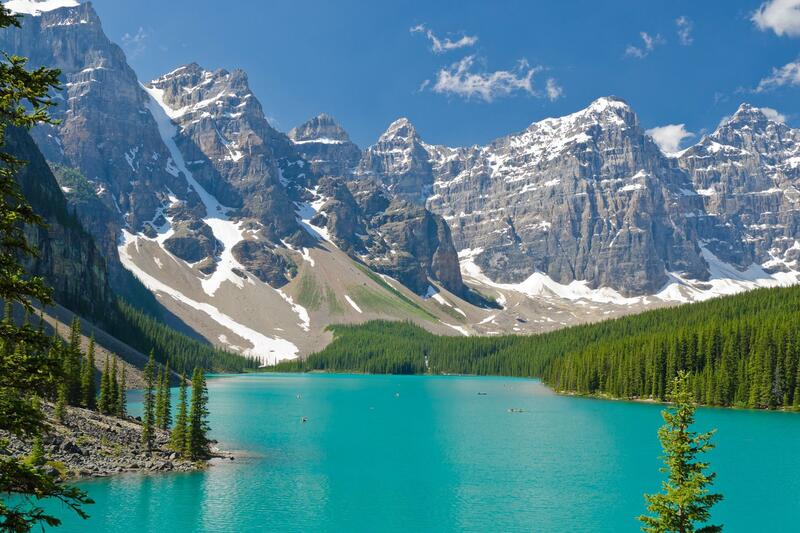 Banff National Park with its craggy peaks and glinting glaciers and Whistler’s world famous ski slopes make it the perfect country for winter sports enthusiasts. If you’re a city-goer though – the country’s major cities hold their own during the colder months too. You can see the annual festival of lights in Toronto, skate at one of the many outdoor rinks in Vancouver or see the ice sculptures, watch a hockey tournament or experience snow-shoeing in Montreal. If you’re time-poor and/or don’t have the budget to go halfway across the world this February, an excellent option for holiday sun is the Canary Islands. Just four hours from London, the islands offer high temperatures, warm blue seas and quaint towns and villages full of small restaurants and pretty squares. Tenerife is the coldest of the islands during this time (average temperature of 16 degrees) but there are good deals to be had. Lanzarote, Fuerteventura and Gran Canaria will all be hotter with average temperatures of 18°C, and highs of 21°C. There is no better way, in my opinion, to spend celebrating an occasion than with the ones you hold near and dear. The little adventurer I am, we decided to celebrate with a bonanza of activities – Part 1 was in Dubai, you’ll read about Part 2 soon but we had so much fun out there, that I got lots of people asking what I did and how we managed to do so much in such a short period of time. Well now you have it… my 72 hours in Dazzling Dubai! Dubai has become an almost imperative city to visit in any ambitious travellers’ “must-see” catalogue and certainly a one-stop shop for wanderers alike. It doesn’t help that the Emirates Airline covers most of the world and uses its home country as a transit point, so at one time or another, almost everyone everywhere will stop in Dubai, and ultimately get allured in by the luxurious gold and futuristic ambiance of the city. It’s the very hub of business and pleasure for the world and links the East with West seamlessly. For 72 hours, On the 19th November, 5 friends and I stopped over in Dubai on our way to Thailand and it was the first time I’d been back since 2012 – although then it was only a 15-hour transit with family. Does that even count? I tend to travel for pleasure whenever I can, which admittedly isn’t often due to workload and demand (that’s changing this year :D), but I was in Dubai to enjoy what the city had to offer and grab a few things for family and friends. We stayed at the 4* Carlton Downtown on Sheikh Zayed Road, Deira in their twin Deluxe Room. I think they upgraded us in all honesty, the room was way too good to be just a Deluxe. Built in 2013, the hotel is home to 357 rooms and suites and whole bunch of extra amenities, including dining and lifestyle venues, spa, fitness centre, tennis court, swimming pool and 23 fully equipped meeting rooms for conferences and events. Preeeeetty cool. Carlton offers a range of entertainment options including Jimmy Wickets Sports Bar & Lounge and Zephyr, the highest AL fresco rooftop lounge in Dubai. We opted for Breakfast included in our stay of course, because honestly, who wants to be looking for places to get decent breakfast first thing when you wake up in the morning. Room 2112 is pretty high up, on the 27th floor. The room had the most amazing views of the city’s skyline and faced onto Sheikh Zayed road. It towers way above the building’s opposite, so we got views of the Arabian Gulf in the distance. The room is slap bang in the middle of the suns path throughout the day and meant our rooms were constantly bathed with direct heat from the sun. We, unapologetically and totally unmatched to the rooms below, got to soak up the breath-taking full views of sunrise and sunsets and crystal-clear azure blue skies. The views were fantastic. I’d booked it through a friend who like the Hyatt, had given us dirt cheap discounts on the room and had told them we were VIP, so the room was probably one of the best they had and rightly so, we were. You’d think it would get pretty loud with the longest highway in Dubai so close, but being so high up with triple glazed, solar controlled windows means it’s virtually sound proof from the outside world. You don’t hear much overhead noise, or horns, or the rush of the constant lengthy traffic that seems to be the cities norm. Check-in was smooth in the grand foyer; the receptionist was this mid height arab/Iraqi/Moroccan young man, maybe mid 20’s but honestly- and I mean this in a total good way – looking like he’d just hit puberty… a very youthful and welcoming smile. He got us checked in swiftly, and Joseph – the Filipino bell boy (or rather, man), greeted us to take our bags up. If you visit, just ask for Joseph really. Like, I’ll keep it that simple for you. His knowledge of the city, best places to avoid and the “cool kids’ hangout” areas saved us a lot of time, and quite frankly we needed it. He was open, relatable and pretty prompt come to think of it. And he was never too far when we needed him. Our room was ready by 11. No lie, the most spacious hotel rooms I’ve ever been in. hands down. We were given a whole 42 sqm of land to live on, and as if that wasn’t enough, we had a work desk and wardrobes, with at least 5/6 small cabinets dotted around for storage and off-loading, and even a couch. We had enough room in there to fit at least 10 adults with luggage comfortably sleeping on the floor, or if you had a little class, perhaps a solid 5 people comfortably in the space for 2 they’d given us. It was amazing. The interiors combine sleek, modern décor with everyday functionality, highlighted by airy finishes and humungous landscape windows. You know them royal houses you see in movies, where even Peter Crouch couldn’t touch the ceilings if he stepped on the bed, this room was the same. The windows are very nearly floor to ceiling, except for a knee-high window seat that overlooks the city. We made good use of this, often spending every waking minute in the rooms perched on here. Whether we were watching the city whizzing beneath us, or having karaoke sessions screaming to our hearts content at the skies or watching the world in silence as night fades into darkness, it served more than its purpose for us. Breakfast is served in the Baÿty restaurant on the 3rd floor of the building, between 6AM and 10AM. The buffet-style food served hails from both authentic Arabian and international cuisine and quite frankly, has everything your heart desires. You want traditional English toast and beans? Here you go. French Toast with dripping syrup but your weird and add avocados to yours too? Here you go, take it. Fresh fruits? Here. Or a full-on Egg Fried Rice with Mushrooms, Sweet potato and Shrimp? They had a whole section for you too, boo. Safe to say most of us got a second round every morning. The staff are accommodating, chefs are at every station’s kitchen to keep food piping hot or readily stocked. My French toast was a rock to my disappointment, it had been sitting under the heat for too long. I only realized after I had sat down, wiped down the cutlery and put the napkin on my lap. Super frustrating. I opted for Nutella and fresh toast but when your hearts set on something… the disappointment doesn’t go away. Everything else was good though- the fruit stored in ice, the beans piping hot, the juices a variety. We missed the special theme night dinner buffets though, featuring live cooking stations with orders prepared to my specifications. Thursdays are Seafood nights, with fresh lobster, crabs, oysters and even tiger shrimp cooked right infront of you. Fridays are Surf and Turf nights and for the steaks, and lambs and chickens and lobsters and high rollers and big spenders. My type of people. Your looking at roughly £30-£50 per meal on one of these nights… but you can get it sent to your room or onto the rooftop terrace and enjoy a meal on the 47th floor of the building instead. Probably my second favorite place in the whole hotel was the Zephyr Rooftop lounge and swimming pool. It is one of Dubai’s highest outdoor restaurant and lounge, playing chilled house music and donning stunning views of Dubai and the Burj Khalifa. We’d spend most times between activities lounging in the sun here, in the pool or grabbing some downtime before bed. It’s a well-known fact now that I can’t swim (yet), so I kind of bobbed up and down in the water for a few hours at a time. At one point, I looked up and could’ve sworn the sky looked like something out of a cartoon… one of those road runner episodes in the desert with scorching heat and a dry, baked earth. It was hot. My favorite place ever though, has to be the Citrus Spa- a female’s health & leisure facility with jacuzzi, steam room and spa facilities. I mean, when on earth do i ever get time to go and delight in the pleasure of a whole jacuzzi?! I’m telling you, this stuff is the beez kneez. It’s the real shizzle. I regret not spending a lot of time up there, but it’s on the 45th floor of the building and open daily 10am to 10pm. My friend surprised me with some treatments, and I opted for a Deep Tissue massage and a full body scrub. Came out feeling like a whole new slippery woman. Shamefully, at my big age, it was also the first time I’d ever been to a spa that didn’t involve my siblings practicing their skills on me, so admittedly, my scope of comparison is limited. It was amazing. KFC is a few doors down, so snacks weren’t too hard to get ahold of. Dubai International (DXB) airport is 12.3km away, a short 7-minute drive. The closest metro station is the financial centre station which is within view of the hotel, a mere 0.3km away and the property allows for a free shuttle service to the beach and shopping centre as well as the airport. The hotel forever has a swarm of valet parking attendants outside the hotel, opening taxi doors for you and greeting you upon arrival, and are super useful should you decide to rent out a vehicle during your stay. The hotel check-in time starts at 2PM and ends at 3AM and check out time is at noon. One thing we should’ve known really but totally forgot what that they require a deposit on the room (incidental charges) when you arrive. Before you even go upstairs, they’ll require you pay 500 AED for anything used or taken from the room. A little frustrating, since we’ll only get the AED back once we check out and then they’ll be no point spending it on our way out… but we negotiated he take £100 GBP instead from us, roughly translating to 468 AED. Close enough. We could then at least have the GBP safe during our stay and use it for later. Tourism fees are of course charged as well, which they later just took out from the room deposit. The city imposes a fee of 15 AED (£3.25) per night- a total of 45 AED for us, translating to £9.65 in total. The location, rooms and service at this hotel was fantastic. The rooms stayed clean 24/7 and it was definitely great value for money. The facilities available to you are abundant in number, and if you ever find yourself bored in your room… you don’t search far to find something to do- something I rarely see in hotels. The food was a little disappointment, but perhaps a slight one-time oversight and not regular for their chefs. The interior of the building synchronizes with Dubai’s famous gold motifs and makes you feel boujee on a budget. I’d recommend this hotel over and over, make sure you at least spend a night here to get a taste of Dubai. Hyatt Place Patong Beach Hotel, Phuket Thailand – Our Stay + Cool Balcony Timelapses! I was in Phuket, Thailand, to celebrate a whirlwind of a year in 2018 with a friend of mine. We’d arrived the day after my 24th Birthday and stayed at the magnificent Hyatt Place Patong Beach Hotel. I’d like to believe and call myself a frequent flyer, but although recently occasional, I’m super nosey and explore everything and anything I can to milk my money’s worth. If you listen carefully to the wind, you can already hear my friends saying “Ain’t that some truth” haha! We booked a Superior Twin Room with Ocean Views at a hugely discounted (I mean, chunk change) rate through a friend of mine. It was recommended as one of the best rooms in the hotel, aside of the Royal Specialty King Room which to be fair, we didn’t really need the whole separate living area. This put us on the highest floor of the hotel, in room 2552, with the most scenic panoramic views I’ve ever seen of an ocean, in all the hotels I’ve ever stayed at. The windows are all floor-to-ceiling glass sliding doors, the flat screen is a 42” HDTV and we have our own snug cosy corner to melt into should we choose. The room is roughly 26 sqm, and I cannot lie to you, it was a lot smaller and a little packed in for the star rating the hotel has. Should we have been very messy and untidy people, the room would have very quickly looked like something out of a pigsty or George Butts American rendition of Hoarders. The room is big, but because of the size of the bed (not complaining!) and the storage and bathroom space (again, not complaining! ), the walkway becomes one-way. Not the end of the world, but definitely a noticeable red flag for me and so different from Carlton Downtown in Dubai that we had just left. To make up for it, Hyatt Place offers impressive angled sliding doors that entirely open up the room to the most enviable view of the Andaman Sea. If you look over the balcony, the room overlooks the outdoor swimming pool and the greenery planted abundantly everywhere in the hotel. We can also see the breakfast bar in the distance down below, but not close enough to see what people are eating or who they are. Pro’s to this is that your well away from the main road, so you’re not disturbed by noise of busy streets and local bars. In fact, the hotel itself, if you choose to drive, is almost certainly somewhere you’ll miss if a local doesn’t show you where it is. Hidden between cobbled streets of local laundry shops and dry cleaners, the very grand and contemporary hotel is on a hilltop, constructed amongst buildings made of dusty bricks and dated design. Dare I say, it’s even in a poverty neighbourhood. It did look quite odd to have a stylish building in the midst of such contradictory milieu, to anyone else it would. It was cool for us to see though, it meant we got to see the lifestyle of natives at our doorsteps, without having to trek too far to find them. You should’ve seen the friendly smiles on their faces, watching us stroll up and down from a totally different life, and yet they’re still waving with passion and authentic beams. They looked happy- sitting on brick balconies at late hours in the heat; men in cotton shorts and soot-covered vests conversing with women sitting at sowing machines, talking, laughing wholeheartedly. They looked genuinely happy. Enviously happy. Back to the point. The hotel was the only modish thing nearby. If you’re after immersing yourself in abit of rich Thai culture, this hotel is the one. Its not so much in a secluded location that you can’t walk down the hill to the main road. Perhaps 5 minutes from leaving your hotel, you come to a roundabout with a gigantic sculpture, leading you to the entrance of Patong Beach. The roundabout has three exits, follow the road round in towards the city and you’ll find massage parlours, restaurants, spas, art exhibits, currency exchanges and masjids. So, no fear- you’ve got everything at your fingertips. The hotel is secluded enough for privacy but in the most perfect location to have everything at your fingertips. We ate breakfast at the hotel- an array of colourful options every morning. We had dinner and lunch outside every day, and there is no shortage of halal restaurants and diners. We ate somewhere different every night, and all within walking distance too. Dinner is also available here but we only ate here when on our last day. Make sure to let the chef know your only eating halal- the waiter forgot to mention it and they made the mistake of adding bacon to my order without seeing who i was. Simon saved the day. We met an expat called Simon, who as soon as we walked in, gave us the “d-low” on the best places to get halal food, directed us to places we didn’t know about and advised on how to get about the safest and best way. Totally unprovoked, we didn’t even need to ask. He made sure we had a good room, our bags were taken upstairs before we got there, arranged for portable chargers when reception staff refused to give us some. Knowing you have an ally in a hotel, in a foreign country, who knows the city well and can understand the Thai language, is one of the most gratifying feelings in the world. A lot of the time, he really went over and beyond and made sure our stay was without issue. He’d spend some time with us during breakfast and ask us about our colourful night out, give us tips, places to try before he moved onto another table. He’d be the first to sort any request we had and drop everything until it was done. He was a legend. Turns out this whole time, he was also the General Manager and never mentioned it once or made it a big deal. He was hands on, stuck in and available to everything we needed- a perfect example of putting us first. Another honourable mention is my homeboy, my favourite driver and the nicest bellhop ever- Bank. Ask for him, ask about him. Just a legend. The distance from the airport to the hotel is gruelling though. I wish someone had told us beforehand. Already extremely hot and sweaty, we landed during the cities peakiest hour and got into a cab from the airport. We’d booked a few excursions from the airport for the next day, which additionally offered free rides to our hotel as a benefit. Once we got in, the driver, understanding no English at all, started driving. The journey, which should’ve been 32 minutes, took 1 hour and 12 minutes to get to our hotel- a road distance of 32.8km. No motorway, no dual carriageway, no freeways. Just weaving in and out the busy city streets on a Thursday afternoon. They would’ve charged us around 800 baht, which translates to roughly £20. The private transfer car was spacious & had a clean and fresh cream leather interior with white crosshatch stitching. Looked good in all honesty. As we drove, listening to some foreign language with the bass up high, we went up and down what seemed like mountains, narrowly showing us glimpses of the sunset on the Andaman Sea. We noticed other luxury resorts pretty close by, and market stalls of rich Asian cuisine. Bangla Road is a short 6-minute ride away and the north entrance to Patong Beach is at your doorstep. Taxi journeys for the whole stay to get from or to the hotel from anywhere averaged to 250 baht, translating to 6 British pounds. All in all, good location and fairly cheap. We didn’t watch much of the TV, so I can’t comment on the quality of the options one is given. The mattresses *satisfied eye roll*, the MATTRESSES THOUGH. Honestly felt like it was being changed every day- instead of the bed-sheets. Its much softer than the Dubai bedding, and super easy to just knock out when you get in. My friend is a testament to this- I’m not sure if she was just tired or liked the bed, but every chance she got she was napping. And she doesn’t do this normally. It didn’t feel like anyone had ever slept on the bed, which felt amazing. The pool downstairs is just as it appears in the photos on the website. It’s a fibreglass pool, with plenty of deck chairs. I am disappointed however, that it doesn’t come much with a view. Unless you are sitting in a particular deck chair, your only view is minimised to other people’s balconies on all four corners. It would’ve been perfect if the block of buildings just below the pool weren’t towering over you, but lucky the buildings height didn’t come close to our room floor. Your better off just waddling down to the beach but even then, locals charge 100 baht (£2.50) for an hour on the deck chairs. Unless you’re staying with a loved one or a good good good friend, the bathroom might be a problem. The room we stayed in seems to not have a door for the bathroom. Although quite good in size, the shower is glass without any means of discretion, and there is no door. Advice- don’t do a dump if the other persons in the room. They’ll smell it. The room also has no means of a wardrobe, just a wall-mounted clothes rail to hang some clothes on with– I kid you not- just 10 hangers. You’ll quickly realise this isn’t enough for two people. Even though the shampoo and conditioners weren’t great, and the swimming pool didn’t have much of a view, the overall standard of the hotel and exceptional service of the staff was second to none and nothing short of amazing from the moment we arrived till the moment we left. Leaving was truly the hardest part. The hotel is beautiful, rooms are great, and service is outstanding. I will certainly be staying here again- if not for Bank and Simon alone. Very highly recommended! Check out the time-lapses I managed to capture on my phone, from our enviable balcony window! The Worlds Longest Urban Zipline + Bonus Video! If like me, you’ve done the whole “fly for 6 hours, go to the mall, shop all day, sleep all night, go to the beach” thing and want some heart racing thrill and throat throbbing excitement in your life, listen I’m telling you… This. Is. IT. The crazy that is me, did a long-haul flight… landed and checked in by 11am, changed, and was at the XLINE booth in Dubai Marina Mall by 12.45pm. As we step in, the signs are huge, so we wander around slowly, taking it in. Men sit around in tailored suits, laughing richly over their latest lavish spends. Couples walk hand in hand, and small groups of Chinese tourists stand in the pathway, ignoring everyone having to walk around them. There are white people, black people, Arabs, Asians, Hispanics and Europeans. Women in stilettos and high neck tops strutting along, looking too made up and plastic for so early in the day. Spa after spa, health centres and luxury hammams line the route. Ghost by Ella Henderson plays over the speaker. Is it normal to feel nostalgic already? Certainly feels like an upgraded version of Westfield, without all the Beckys and hoodrats that roam around day and night. Smells like warm melted chocolate, & it feels good… This aint London for sure. A bus service chauffeured us to Amwaj Towers, a residential building 41 stories high and raises up a whole 170m off the ground and 558 feet away from civilization. For those in London, a good comparison is that it is a little under the BT Tower in Camden and 10m taller than the building with the Sky Garden. Imagine jumping off that?! Bloody hell, even that gives me chills. I think it was much easier because I just didn’t know. I didn’t know how high up or which building until last minute. Then, the demons in your heads can’t play games with you. Murphy’s law can’t act up and whisper in your ear. You just don’t know. Legally Blind. We took a lift to the 40th floor and walked up 2 flights of stairs to get to the roof. One guy, Australian fella, had come alone, and you could see his heart pounding with evident sweat. A fat grin plastered through his ginger beard. He was perhaps no more than 26, travelling through Dubai for a day or two. He’d be going to Thailand next he told us, and we’d mentioned we’d be going too. 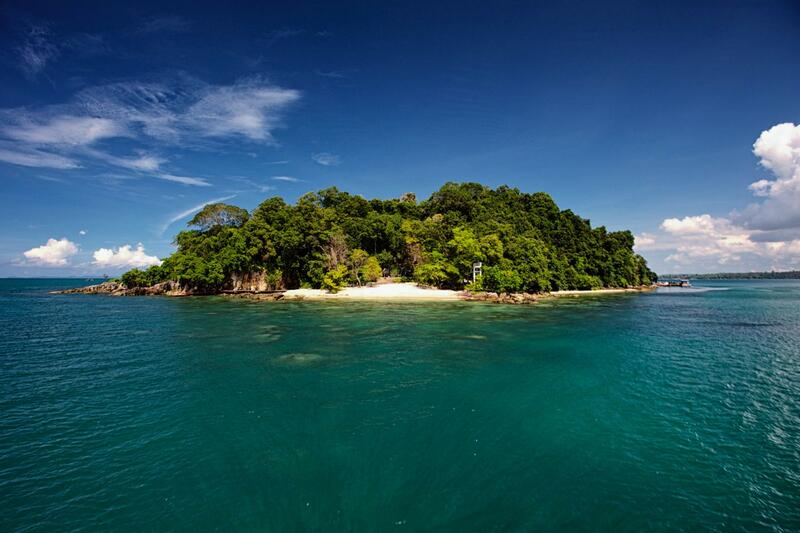 He’d said he’d be near Phuket, staying at Phang Nga Bay. The conversation was short. The view on the rooftop of the 40th floor is breath-taking. The crystal, sapphire-blue sky is cloud-less for early afternoon. It was mesmerising, how simple it looked, yet it seemed to hold every one of our thoughts, dreams, our secrets. The space was a vast thing, stretching out for infinity over our heads. It was terrifying and yet so affectionate, daunting yet friendly. If you stared at it for a long time, watching everything come and go, you would think, maybe, it was all talking to you. It was communicating in a language you couldn’t begin to understand. I got lost in thought before they called for the first two volunteers. Of course, I volunteered. The worlds longest urban zipline- twice the distance and lasts twice the time at twice the speed as the last one. And I volunteered to go first. My ginger beard friend volunteered to come with, and slowly, we made our way to get strapped into the superman harness. The guy high fives you, attaches you onto the cable that your trusting with your life, and makes you lie down horizontal onto a launch bed. Once you’re in, the bed is lowered and your hanging, mid-air, 40 floors up, A WHOLE 558 FEET AWAY FROM THE GROUND, ready to fly. I nearly shat myself. I nearly cried and yelled right there to get me off. Whenever I get myself into moments like this, silence is my friend. Someone once said, “Feel the fear, and do it anyway.” Often, we think, “I’ll do it when I am not so afraid.” But in reality, it works the other way around. The ‘doing it’ comes before the fear goes away. The only way to get rid of the fear of doing something is to go and do it. So, we diiiiiiiiiiiiiiid it baby! We done flew through the sky, over land and water, at up to 80km/h and from 170m down to ground level. I FLEW, did the Michael Jackson moonwalk mid-air, imitated wonder woman, became a local super hero. I FLEW. And it was amazing. The marina water glistens, and yachts bob up and down below you. Everything is so saturated this time of day, full HD colour. You supposed to be streamlined. like a bullet. They told us if you start turning to one side, pull your weight to the other. I nodded. Easy. I’m not sure what juice they drank to not tell us how strong those winds would be. Wind veered me right, my weight got pushed to the left. I almost flipped, slipped and tripped mid-air. You still move forward, and the helmet provides some sort of aerodynamic vacuum for you. But lard haffi mercy, I could’ve been a leaf in the wind the way I was twisting up in here. Lasted a few seconds though. So, prepare for it. You will be twisted. If you go, maybe don’t pick the right rope out the two. As you draw closer to ground level, you come awfully close to the brick corner of the mall building. Its quite the scare at the speed your going at- an uncomfortable but safe distance. The whole thing is recorded, and photography is taken for you by the XLine team. The goPro strapped to your helmet gets the best shots of the experience, and so, feeling more alive than ever, we made our way to our lockers to update the world. The experience felt super safe, built and operated by highly qualified and globally certified teams. They carry out daily testing and regular maintenance of the line, making sure safety is always first. Id like to hope so anyway! 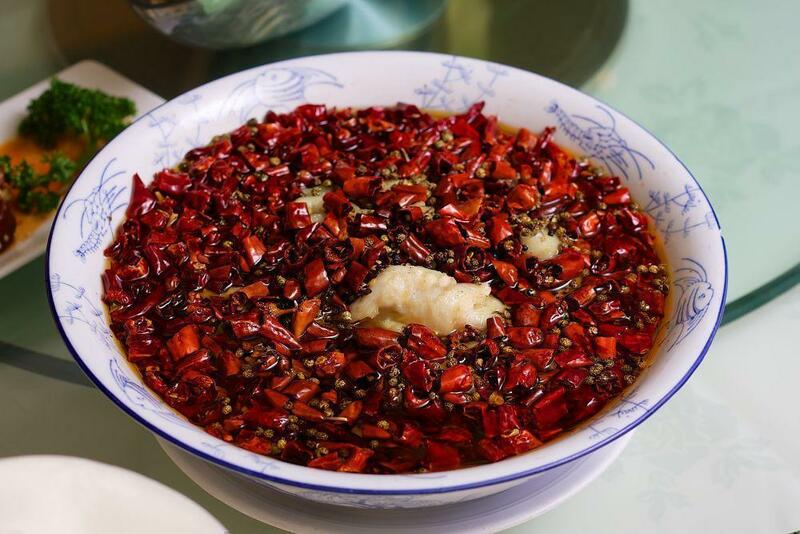 The company have strict requirements for the experience; You need to be between 12 and 65 years of age, taller than 130cm, weigh 50 to 100kg and in good medical health. Loose clothing can’t be worn, and footwear is preferably sportwear or boots. Closed. They take off every single day from 9am till 5pm and are situated inside the Dubai Mall. You can click here to book it or visit the booth at the Marina Mall or visit any of the Platinumlist partner merchants across the UAE. The entire experience lasts for approximately 90 minutes, from registering at the XLine booth until you complete the zipline ride. So, if your looking to go… get ready to hang tight and I’ll see you someday to applaud you. It isn’t for the weak hearted, that’s for sure. Definitely going to do this again… perhaps this time in Ras Al-Khaimah for the entire world’s longest zip line. A whole 2.83 km long, the Jebel Jais flight is 1,680 meters above sea level and has a glass bottom suspended floor. Um… YES PLEASE. BY far my favourite, and the one I was most excited for leading up to it. On the morning of my 24th Birthday, at 5.25AM, an Indian man dressed in dungarees, donning an overgrown moustache, picked us up. We drove 36-minute to the take-off site, where the largest Hot Air Balloons in the world are being inflated, glowing in the predawn darkness. Although still dark, the world of Dubai is still lit and roads still busy, we can see filtered bits of light looming in as birds awaken and stir. It’s just before sunrise, and we take off to meet the sun as it rises over the Arabian desert and the sky fills with light. Early morning provides the best flying conditions. The tent is filled up with hot air using a burner, which somehow manages to get bucket loads of sand all over us- so wear a hat. The shower of sand only lasts whilst you’re on the ground- don’t look up during lift off or your teeth take a grit bath and your eyelashes are coated in a blanket of fine granular rocks. You’d think after passing the headache that is security and check-in at an airport, you’d have nothing to worry about besides getting to your gate on time and having your fully charged phone ready at hand. Already exhausted and feeling my bones about to give way, I just about made it to Athens International Airport for my connecting flight. A much needed helping hand..
As I walked in, a Caucasian lady alone in a wheelchair crossed me, manoeuvring her way silently through the airport. My conscious mind wouldn’t normally register it. This was a lady, on her way somewhere and you, my darling, have someplace to be. so focus. Yet… her face troubled me. I looked back and asked if she knew where she was going. Mainly for the sake of it. Worst thing in the world is being lost, and not asking for help. Perhaps its shyness, perhaps its pride. Either way, if I could do something, I’d do it. She turned. Smiled. She was heading to the same side of the airport, her battered fingers tired from manually turning her wheels. Kind of hurt me to see her like that, but with 30 minutes to get to my gate, I offered to push. I don’t even remember her name. I hope someday I bump into her again, her deep-set smile grateful for a little help. Sometimes, in life, if you can lessen the burden of another, you might be able to change their world. Nobody knows what anyone’s going through, emotionally, mentally or physically. We don’t know what wound a simple kind gesture can heal. I left her at her gate, and sped-walked to mine. Aegean Airlines Airbus A320 arrived and the next hour and 25 minutes was filled with power naps and constantly questioning my choices in how I decide to spend my weekends. I mean, realistically, who does this? In the past 24 hours, this little hijabi had coffee in Vienna and lunch in Athens, dragging an entire suitcase, alone and insanely tired. I’m borderline regretting this already. It’s pretty dark outside; no lights, just sea. The only sound is from the deafening propeller engines constantly humming and dipping to their own tune. Soothing. We landed in Thira on Saturday afternoon at exactly 19:13. First stop, hotel. I picked the Rocabella Hotel Resort & Spa because of its room view, its location and its services. I completely underestimated the hospitality here. Every part of my body crying, I walked in. Maria met me, and sent someone to take my luggage to my room right away. How awfully sweet, and lord was it needed! A glass of still cold fresh juice was waiting for me in my room, I felt a little pampered before I’d even settled in. The next 4 hours were spent sleeping in my double bed, wearing off the exhaustion that had settled from the past few hours. Unlike my very calculated plan in Athens, it was an absolute fail for Santorini. I knew it the second I woke up. Its midnight, and my deluxe caldera view room was the most magnificent thing in the world. My private balcony overlooked the sea, and at 12pm at night, it was glorious and captivating in its beauty. If you read my Barcelona story, you’ll know how crazy in love I am when it comes to the sea. This time, I had the luxury of seeing it so close but from the comfort of my room. I switch off the light behind me, and take a seat. Lets a take a minute here, because you really need to see what I saw. Let me show you my view. Everything’s dark. Real dark. The sky is pitch-black, albeit specks of light dancing somewhere behind the haze of thin black clouds. Some stars are dull, merely flickering into existence now and then, but if you stare, some stars shimmer, glow and light up the night. The moon is oh so clear, directly ahead from where you’re sitting, its neon light bleaching the world into grey-scale silence. The sky and sea meet somewhere in the distance, and infront of me, water sways and glistens, freckled with the reflection of glittering lights. The wind keeps brushing against the water’s surface, the ripples ruffling the stillness and disturbing the peace. I sit with a thick blanket over me, on a hard wooden deck chair, donning two layers of hoodies. It’s cold. Goosebumps keep erupting through my skin. It’s not enough to make me get up, and in silence I observe something I’ll probably not get to do in again in a while. Music plays in the distance, and in a remote space up ahead, neon lights reflect off the marina with echoes of laughter and drunk conversation. In the quiet stillness of my room, I feel relaxed and at peace. The night is beautiful. Fresh fruit, some softened nuts, beans on toast and a croissant serve as my breakfast. Gwitta, the breakfast chef, was attentive to every detail. I asked if there were any halal meat options to go with the beans on toast, and she profusely apologised. She later sent a platter of chocolates to my room, which, can’t lie, surprised me. It was awfully kind of her. The dining space was under renovation so I headed out onto a terrace with seats. Definitely a good way to start the day. After breakfast, I opted for the complimentary spa treatment until noon. Spa tub, massage and full body treatment. Lovely stuff. I’d spent nearly 12 hours in Santorini, and I hadn’t even explored it yet. I just wanted to stay indoors, sleep some more. Perhaps jet lag was catching up to me? A roughly 20 minute walk from the hotel, was the village of Imerovigli. My first stop in my little expedition. The little village is another level of picturesque- when you think Santorini, this village is what you picture. Houses and houses crammed onto the decline of a cliff, all painted white, built amphitheatrically around the caldera and crossed by extremely narrow paved paths. It was crammed for a Sunday afternoon, I kept having to slow down, stop or squeeze through narrow pathways as people came in both directions constantly. I headed to Skaros Rock, which was cobbled with stones and a little distant from the village. I’d planned to go all the way down the beaten path, up to the rock head and take pictures… but things turn out a little different when you see it in real life. The rock was insanely huge- I don’t know if the rock was stable, I don’t know what I was thinking, heck I don’t even know if it was safe to climb it. This was something you did with someone. You slip, they have your back. I was not, I repeat, was not looking to fall off this cliff and have an unclaimed body in another country. Not siree’. Not today, Murphy. Not ‘appnin. Nope. I’ll conquer that rock someday, not today. Instead, I took the seaside path towards Kandakhor and stopped off at La Maison. I only wanted a quick bite but again, Santorini found a way to keep me occupied and in awe. La Maison is like a little haven of fine dining on the edge of a cliff- a literal glass box with 360° windows showing off Greece’s caldera, the sea, volcano, sunset and even nearby islands. Thing is, it’s also a very romantic spot and for a late afternoon meal, the vibe and music made me totally out of place. At least I know where to come back to when I return with company. There isn’t much choice, infact none at all, for the halal eaters… but seafood was an option. First time ordering mussels in my life, I looked at the waiter as if to say with my eyes… “I’m ordering this but I don’t want it” but he didn’t get it. It’s ok. I got distracted by the sea and the changing hues in the sky. By now it’s about 5pm. The sun sets in around 2 hours. I move quickly and down towards the Nomikou M right by the descending cable cars, connecting the town of Fira to the port. Here, for €5 each way, you get to go down to the town, Santorini’s capital, in literally 5 minutes tops. Another town of whitewashed buildings, Fira is built on the edge of a 400 metre high caldera on the western edge of the island. The plan was to take a boat trip from here but given time limitations, it’ll have to go on my list for next time. You get a glimpse of what I saw in a short video on my instagram, but words or video could not accurately depict that moment. I got back to Rocabella Hotel with a full wedding procession in full swing. The groom was so well dressed, arms bulging in his tailored suit. I presume the man holding onto his shoulder was his dad, speaking softly to him, looking down. Maybe he was tearing up, maybe he saw something on his shoe, and maybe he was in the middle of a lie and couldn’t make eye contact. I don’t know. The lift opened, and the doors closed on the chaos behind me. Quick shower, change of clothes. I came back down to the same commotion, and without hesitation, I ordered some sparkling juice and strolled right over to the bride to congratulate her. She beamed, not really knowing what to say or how to react. I guess you don’t fly out to Greece with the whole world for your wedding, it’s more a private function so you’d know everyone attending. I found two fairly young Asian ladies watching intently at the scene unfolding before them, from a corner. They looked hesitant, but smiled warmly. Sealed their fate with that smile. I now found people to spend the evening with and kawaliss the wedding. The party went upstairs onto a large purpose built terrace and we followed. Don’t ask me why, I have no idea. Fairy lights everywhere, a make shift bonfire in the centre and speakers that were on full volume. Some sort of party began to commence. I say this alot, but when I tell you that some moments are literally a blur and flash of excitement, adrenaline and insane laughter that you can’t recall in one single memory, only then do you know you’ve enjoyed yourself. I have flashbacks of a cliff side party, the moon in the distance, the sky back to its jet-black canvas. People laughing, sweat glistening on everyone’s forehead and Marc Anthony’s voice hurting my eardrums. Perched on the ledge of a short wall, overlooking the sea, looking back at this madness, I laughed to myself. This was insane. I left this madness at around 11pm and went to my room. Don’t be fooled though, nobody leaves a party empty handed- I had probably taken every single bit of chocolate ganache, 4 plastic bowls filled with big chunks of vanilla wedding cake, small vanilla things, and biscuits to last a lifetime. Nobody would miss it, and I was hungry. I sat in my bed, opened my balcony to let the salty sea breeze in and started answering emails on my iPad. Whatta night. Morning came and I checked out. My flight back home to London wasn’t until 2pm so once breakfast was over, I grabbed some sun glasses and headed to try some golf nearby with my new Asian friends. Not sure if they would give me that title, but they sure as hell were my friends from now on. I found out on the day that I’m leaving, Rocabella hosts a whole range of water activities including snorkelling, sailing, scuba diving and water skiing. I could’ve rented out a bicycle and jumped on one of the trails nearby. Parasailing was an option. Helicopter and airplane tours were available on site, even scooter and moped rentals. That’s alot of things on my bucket list that could’ve been ticked off. But again, ain’t nobody claiming my body if I die in any of those situations. I’m definitely coming back here sometime in 2017. Santorini, our time was fun. Rocabella, see you soon. I headed home with a 2 hour stop over at Athens, and a 5 hour stop in Frankfurt. It felt good, I’d be back home to mumma’s cooking real soon.